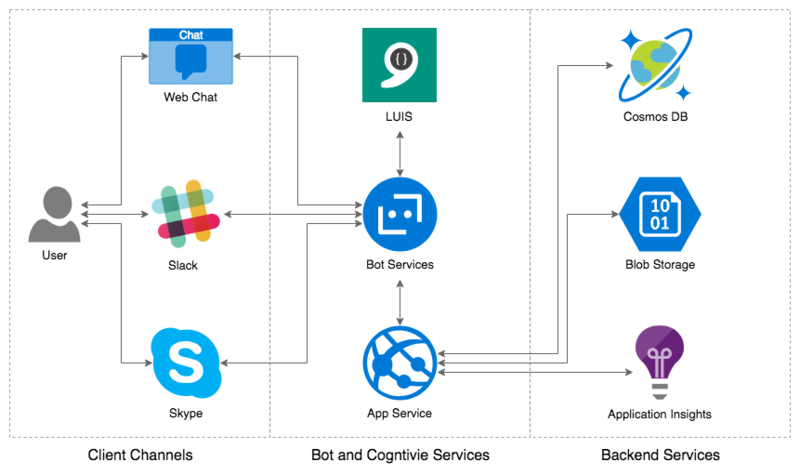 In this post, we will explore the development of a machine learning-based LUIS-enabled chatbot using the Azure Bot Service and the BotBuilder SDK. We will enhance the chatbot’s functionality with Azure’s Cloud services, including Cosmos DB and Blob Storage. Once built, we will integrate our chatbot across multiple channels, including Web Chat and Slack. 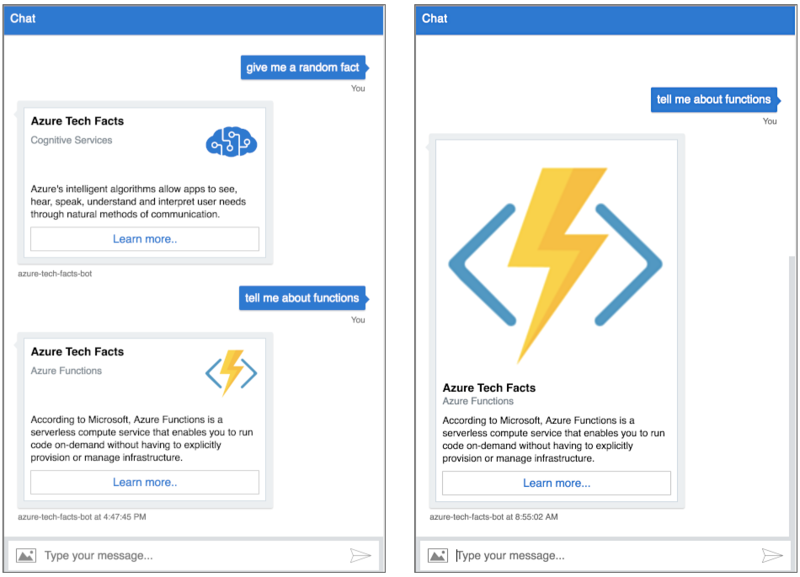 If you want to compare Azure’s current chatbot technologies with those of AWS and Google, in addition to this post, please read my previous two posts in this series, Building Serverless Actions for Google Assistant with Google Cloud Functions, Cloud Datastore, and Cloud Storage and Building Asynchronous, Serverless Alexa Skills with AWS Lambda, DynamoDB, S3, and Node.js. All three of the article’s demonstrations are written in Node.js, all three leverage their cloud platform’s machine learning-based Natural Language Understanding services, and all three take advantage of NoSQL database and storage services available on their respective cloud platforms. Here is a brief overview of the key Microsoft technologies we will incorporate into our bot’s architecture. 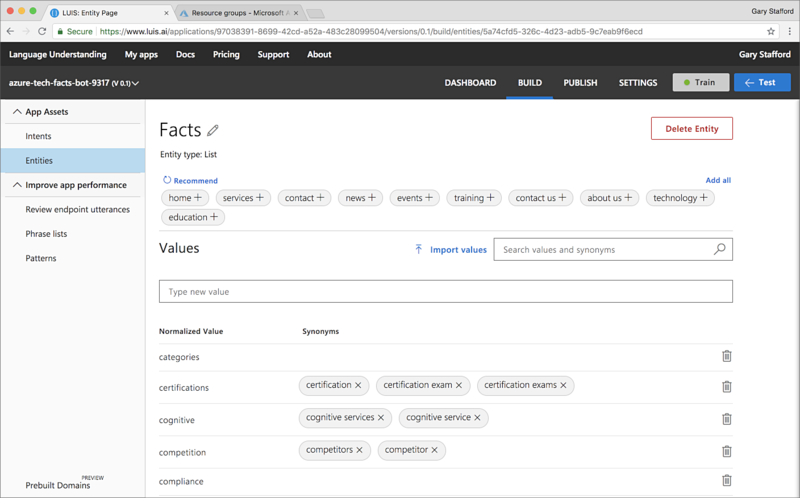 The machine learning-based Language Understanding Intelligent Service (LUIS) is part of Azure’s Cognitive Services, used to build Natural Language Understanding (NLU) into apps, bots, and IoT devices. According to Microsoft, LUIS allows you to quickly create enterprise-ready, custom machine learning models that continuously improve. Designed to identify valuable information in conversations, Language Understanding interprets user goals (intents) and distills valuable information from sentences (entities), for a high quality, nuanced language model. 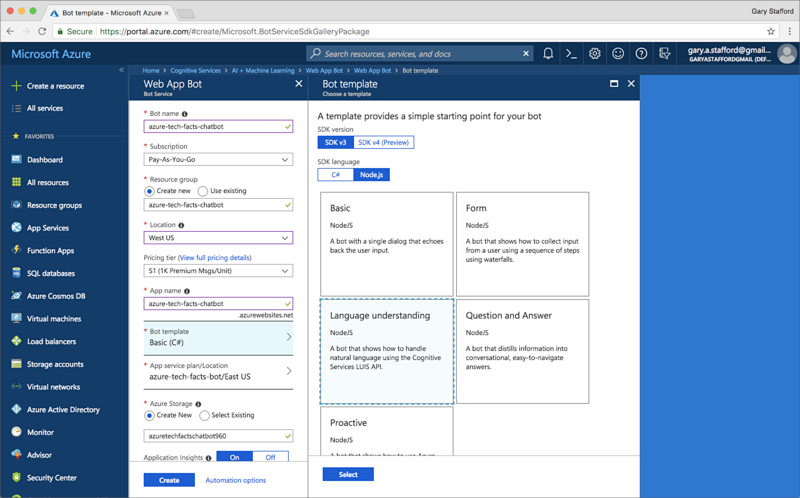 Language Understanding integrates seamlessly with the Speech service for instant Speech-to-Intent processing, and with the Azure Bot Service, making it easy to create a sophisticated bot. A LUIS bot contains a domain-specific natural language model, which you design. The Azure Bot Service provides an integrated environment that is purpose-built for bot development, enabling you to build, connect, test, deploy, and manage intelligent bots, all from one place. Bot Service leverages the Bot Builder SDK. 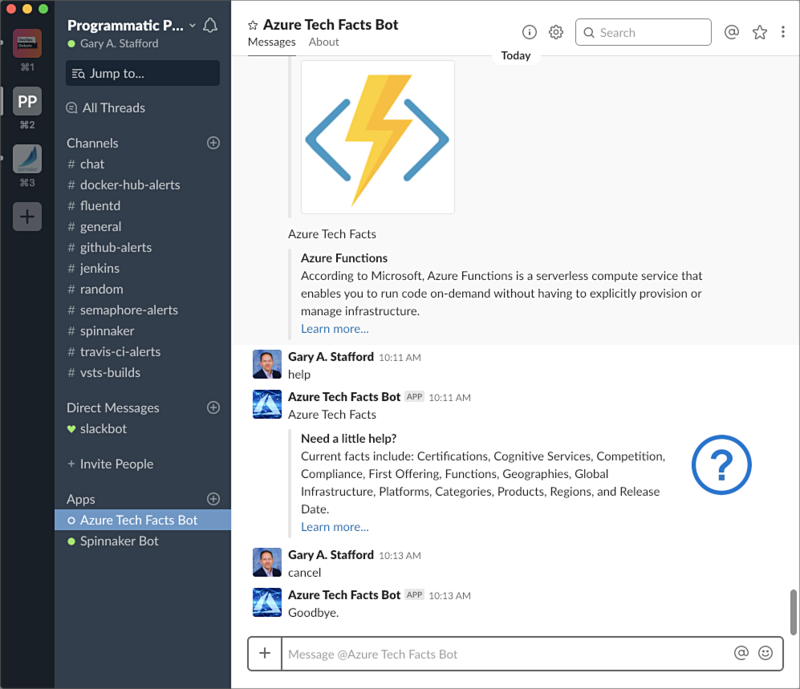 The Bot Builder SDK allows you to build, connect, deploy and manage bots, which interact with users, across multiple channels, from your app or website to Facebook, Messenger, Kik, Skype, Slack, Microsoft Teams, Telegram, SMS, Twilio, Cortana, and Skype. Currently, the SDK is available for C# and Node.js. For this post, we will use the current Bot Builder Node.js SDK v3 release to write our chatbot. According to Microsoft, Cosmos DB is a globally distributed, multi-model database-as-a-service, designed for low latency and scalable applications anywhere in the world. Cosmos DB supports multiple data models, including document, columnar, and graph. Cosmos also supports numerous database SDKs, including MongoDB, Cassandra, and Gremlin DB. We will use the MongoDB SDK to store our documents in Cosmos DB, used by our chatbot. According to Microsoft, Azure’s storage-as-a-service, Blob Storage, provides massively scalable object storage for any type of unstructured data, images, videos, audio, documents, and more. We will be using Blob Storage to store publically-accessible images, used by our chatbot. 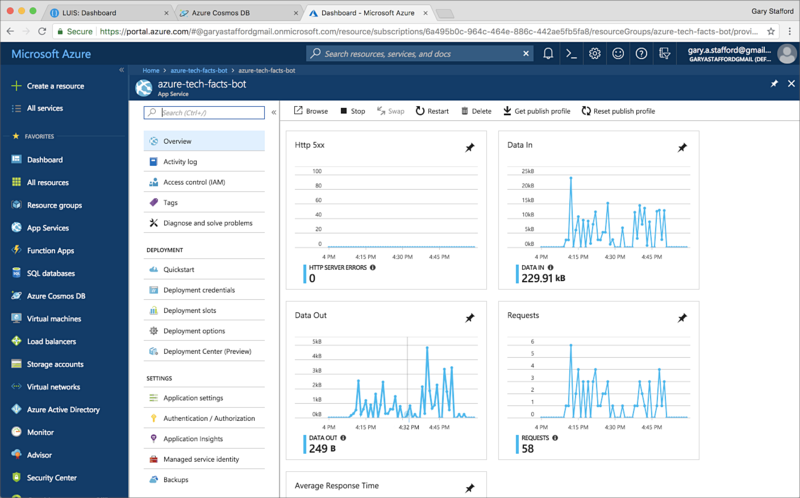 According to Microsoft, Azure’s Application Insights provides comprehensive, actionable insights through application performance management (APM) and instant analytics. Quickly analyze application telemetry, allowing the detection of anomalies, application failure, performance changes. Application Insights will enable us to monitor our chatbot’s key metrics. A chatbot user interacts with the chatbot through a number of available channels, such as the Web, Slack, and Skype. The channels communicate with the Web App Bot, part of Azure Bot Service, and running on Azure’s App Service, the fully-managed platform for cloud apps. LUIS integration allows the chatbot to learn and understand the user’s intent based on our own domain-specific natural language model. 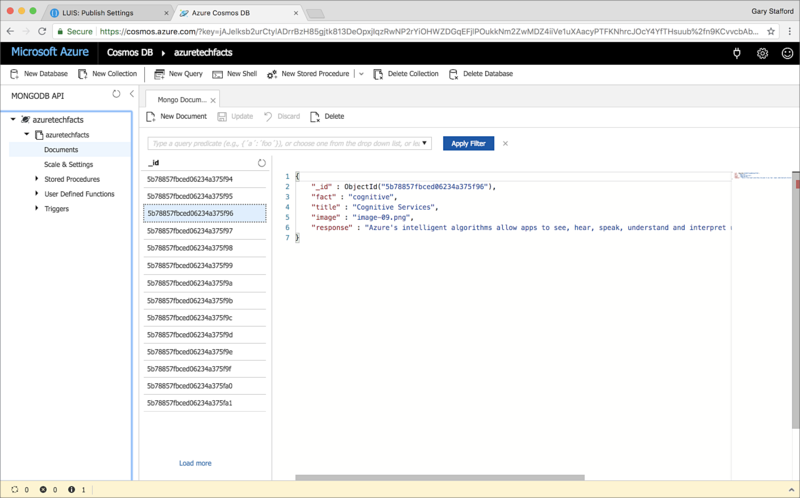 Through Azure’s App Service platform, our chatbot is able to retrieve data from Cosmos DB and images from Blob Storage. Our chatbot’s telemetry is available through Azure’s Application Insights. Another way to understand our chatbot architecture is by examining the Azure resources necessary to build the chatbot. Below is an example of all the Azure resources that will be created as a result of building a LUIS-enabled bot, which has been integrated with Cosmos DB, Blob Storage, and Application Insights. 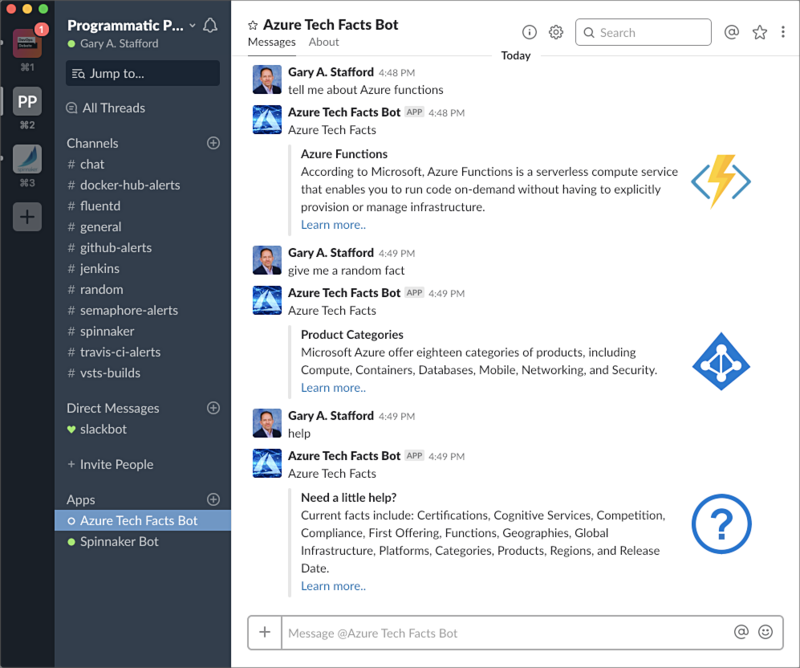 As a demonstration, we will build an informational chatbot, the Azure Tech Facts Chatbot. The bot will respond to the user with interesting facts about Azure, Microsoft’s Cloud computing platform. Note this is not intended to be an official Microsoft bot and is only used for demonstration purposes. All open-sourced code for this post can be found on GitHub. The code samples in this post are displayed as GitHub Gists, which may not display correctly on some mobile and social media browsers. Links to the gists are also provided. 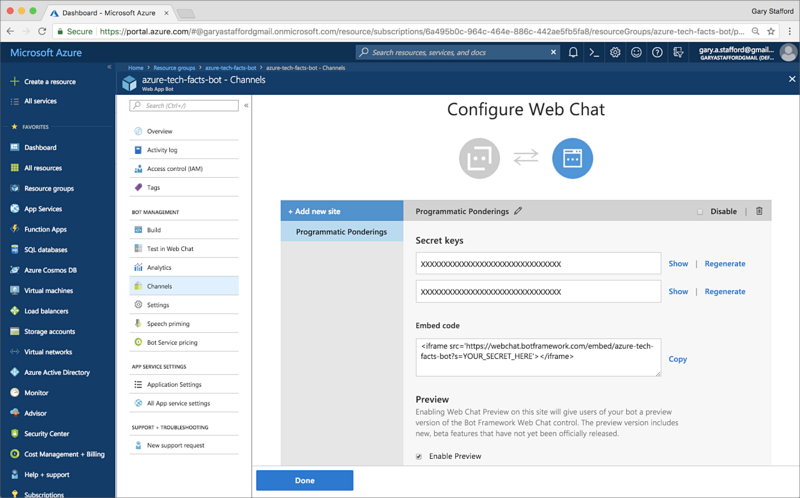 This post will focus on the development and integration of a chatbot with the LUIS, Azure platform services, and channels, such as Web Chat and Slack. The post is not intended to be a general how-to article on developing Azure chatbots or the use of the Azure Cloud Platform. Building the chatbot will involve the following steps. The post assumes you have an existing Azure account and a working knowledge of Azure. Let’s explore each step in more detail. Be aware, you will be charged for Azure Cloud services when building this bot. Unlike an Alexa Custom Skill or an Action for Google Assistant, an Azure chatbot is not a serverless application. A common feature of serverless platforms, you only pay for the compute time you consume. There typically is no charge when your code is not running. This means, unlike AWS and Google Cloud Platform, you will pay for Azure resources you provision, whether or not you use them. Developing this demo’s chatbot on the Azure platform, with little or no activity most of the time, cost me about $5/day. On AWS or GCP, a similar project would cost pennies per day or less (like, $0). Currently, in my opinion, Azure does not have a very competitive model for building bots, or for serverless computing in general, beyond Azure Functions, when compared to Google and AWS. The first step in developing a chatbot is designing the conversation flow of the between the user and the bot. Defining the conversation flow is essential to developing the bot’s programmatic logic and training the domain-specific natural language model for the machine learning-based services the bot is integrated with, in this case, LUIS. What are all the ways the user might explicitly invoke our chatbot? What are all the ways the user might implicitly invoke our chatbot and provide intent to the bot? Taking the time to map out the possible conversational interactions is essential. With more advanced bots, like Alexa, Actions for Google Assistant, and Azure Bots, we also have to consider the visual design of the conversational interfaces. In addition to simple voice and text responses, these bots are capable of responding with a rich array of UX elements, including what are generically known as ‘Cards’. Cards come in varying complexity and may contain elements such as text, title, sub-titles, text, video, audio, buttons, and links. Azure Bot Service offers several different cards for specific use cases. Another layer of complexity with bots is designing for channels into which they integrate. There is a substantial visual difference in a conversational exchange displayed on Facebook Messanger, as compared to Slack, or Skype, Microsoft Teams, GroupMe, or within a web browser. Producing an effective conversational flow presentation across multiple channels a design challenge. We will be focusing on two channels for delivery of our bot, the Web Chat and Slack channels. We will want to design the conversational flow and visual elements to be effective and engaging across both channels. The added complexity with both channels, they both have mobile and web-based interfaces. We will ensure our design works with the compact real-estate of an average-sized mobile device screen, as well as average-sized laptop’s screen. Below are two views of our chatbot, delivered through the Web Chat channel. To the left, is an example of the bot responding with ThumbnailCard UX elements. The ThumbnailCards contain a title, sub-title, text, small image, and a button with a link. Below and to the right is an example of the bot responding with a HeroCard. The HeroCard contains the same elements as the ThumbnailCard but takes up about twice the space with a significantly larger image. Below are three views of our chatbot, delivered through the Slack channel, in this case, the mobile iOS version of the Slack app. Even here on a larger iPhone 8s, there is not a lot of real estate. On the right is the same HeroCard as we saw above in the Web Chat channel. In the middle are the same ThumbnailCards. On the right is a simple text-only response. Although the text-only bot responses are not as rich as the cards, you are able to display more of the conversational flow on a single mobile screen. Lastly, below we see our chatbot delivered through the Slack for Mac desktop app. Within the single view, we see an example of a HeroCard (top), ThumbnailCard (center), and a text-only response (bottom). Notice how the larger UI of the desktop Slack app changes the look and feel of the chatbot conversational flow. In my opinion, the ThumbnailCards work well in the Web Chat channel and Slack channel’s desktop app, while the text-only responses seem to work best with the smaller footprint of the Slack channel’s mobile client. To work across a number of channels, our final bot will contain a mix of ThumbnailCards and text-only responses. As an alternative to Microsoft’s Cognitive Service, QnA Maker, we will use Cosmos DB to house the responses to user’s requests for facts about Azure. When a user asks our informational chatbot for a fact about Azure, the bot will query Cosmos DB, passing a single unique string value, the fact the user is requesting. In response, Cosmos DB will return a JSON Document, containing field-and-value pairs with the fact’s title, image name, and textual information, as shown below. There are a few ways to create the new Cosmos DB database and collection, which will hold our documents, we will use the Azure CLI. According to Microsoft, the Azure CLI 2.0 is Microsoft’s cross-platform command line interface (CLI) for managing Azure resources. You can use it in your browser with Azure Cloud Shell, or install it on macOS, Linux, or Windows, and run it from the command line. (gist). There are a few ways for us to get our Azure facts documents into Cosmos DB. Since we are writing our chatbot in Node.js, I also chose to write a Cosmos DB facts import script in Node.js, cosmos-db-data.js. Since we are using Cosmos DB as a MongoDB datastore, all the script requires is the official MongoDB driver for Node.js. Using the MongoDB driver’s db.collection.insertMany() method, we can upload an entire array of Azure fact document objects with one call. For security, we have set the Cosmos DB connection string as an environment variable, which the script expects to find at runtime (gist). When a user asks our informational chatbot for a fact about Azure, the bot will query Cosmos DB. One of the values returned is an image name. The image itself is stored on Azure Blob Storage. The image, actually an Azure icon available from Microsoft, is then displayed in the ThumbnailCard or HeroCard shown earlier. According to Microsoft, an Azure storage account provides a unique namespace in the cloud to store and access your data objects in Azure Storage. A storage account contains any blobs, files, queues, tables, and disks that you create under that account. A container organizes a set of blobs, similar to a folder in a file system. All blobs reside within a container. 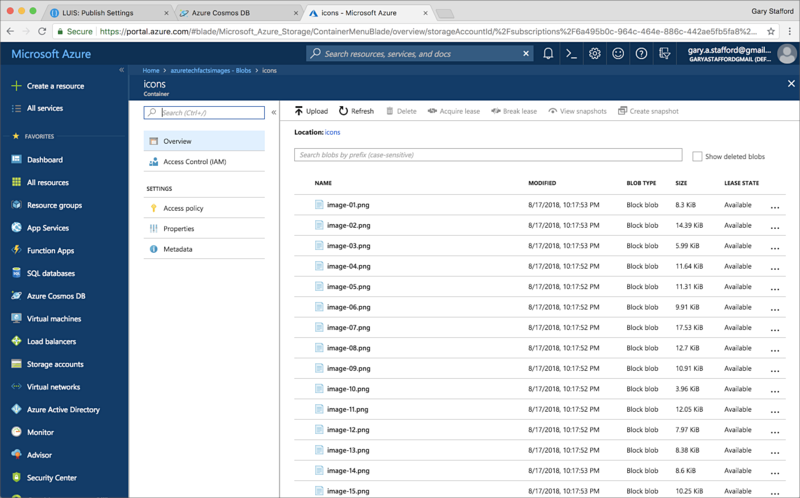 Similar to Cosmos DB, there are a few ways to create a new Azure Storage account and a blob storage container, which will hold our images. Once again, we will use the Azure CLI (gist). 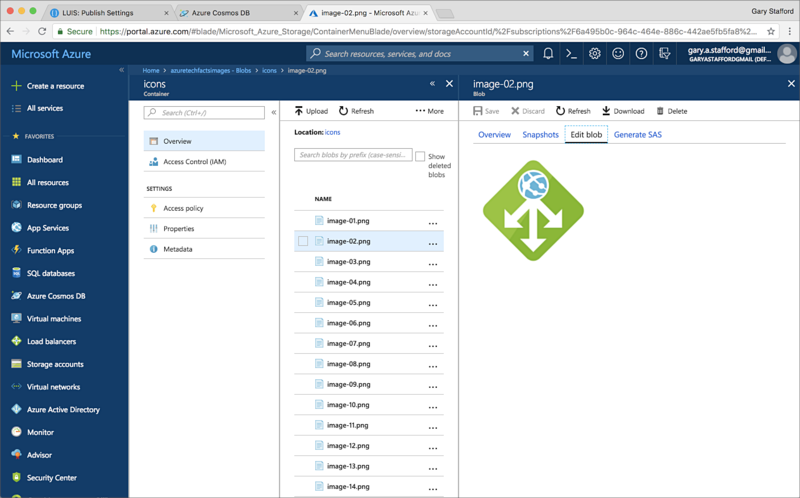 Once the storage account and container are created using the Azure CLI, to upload the images, included with the GitHub project, by using the Azure CLI’s storage blob upload-batch command (gist). 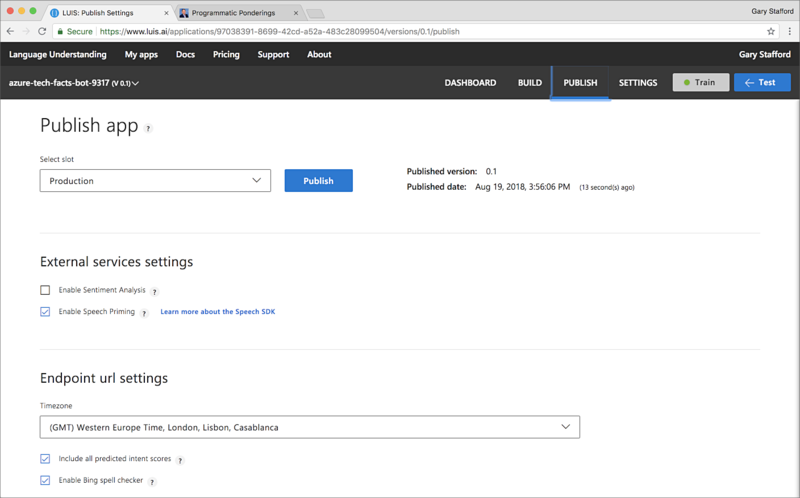 To create the LUIS-enabled chatbot, we can use the Azure Bot Service, available on the Azure Portal. 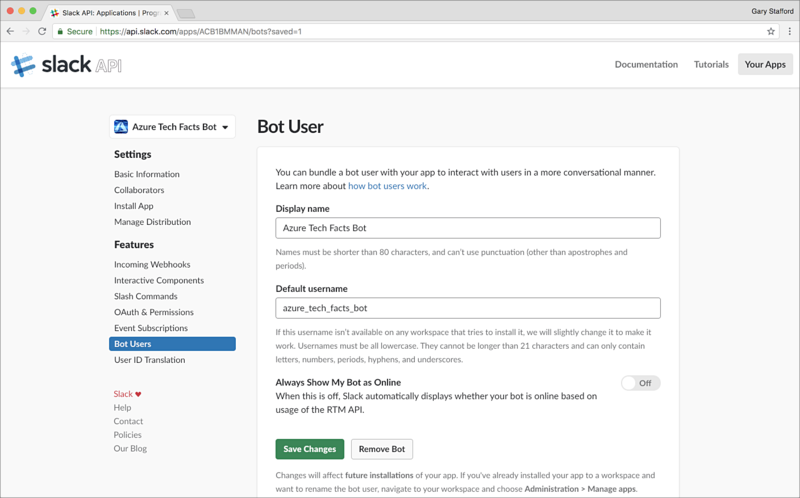 A Web App Bot is one of a variety of bots available from Azure’s Bot Service, which is part of Azure’s larger and quickly growing suite of AI and Machine Learning Cognitive Services. 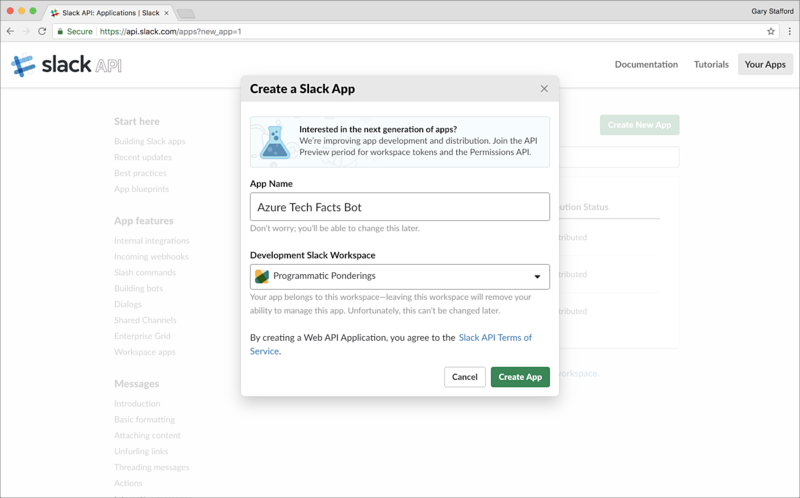 A Web App Bot is an Azure Bot Service Bot deployed to an Azure App Service Web App. An App Service Web App is a fully managed platform that lets you build, deploy, and scale enterprise-grade web apps. To create a LUIS-enabled chatbot, choose the Language Understanding Bot template, from the Node.js SDK Language options. This will provide a complete project and boilerplate bot template, written in Node.js, for you to start developing with. I chose to use the SDK v3, as v4 is still in preview and subject to change. 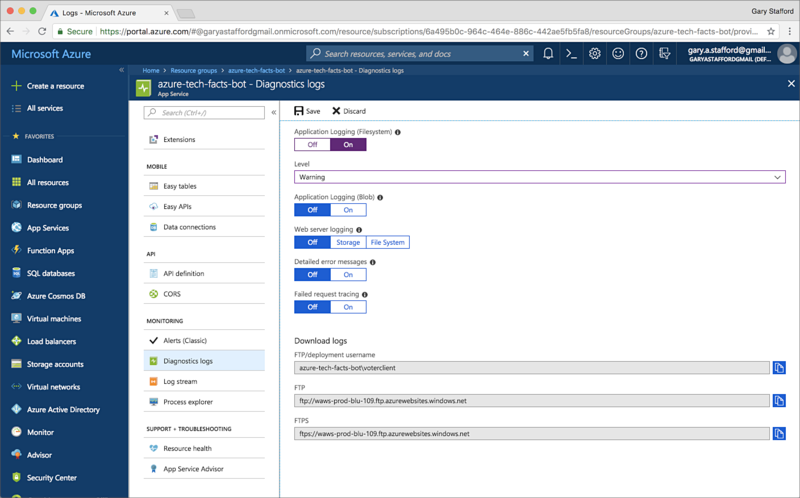 A great DevOps features of the Azure Platform is Azure’s ability to generate Azure Resource Manager (ARM) templates and the associated automation scripts in PowerShell, .NET, Ruby, and the CLI. This allows engineers to programmatically build and provision services on the Azure platform, without having to write the code themselves. 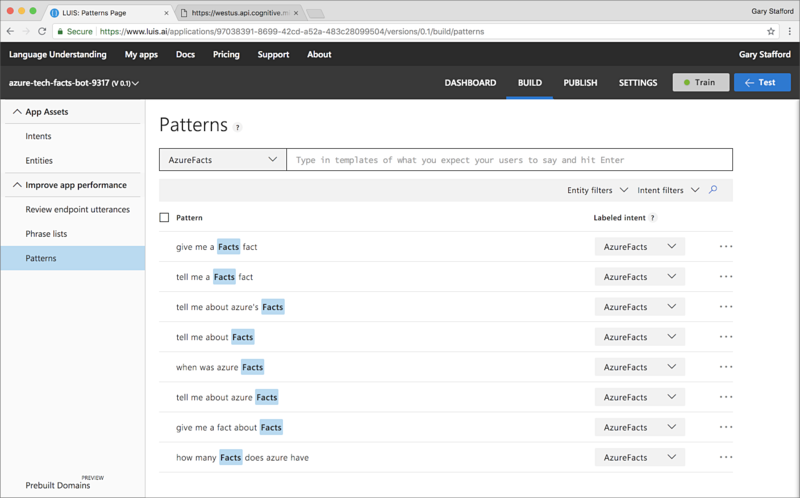 To build our chatbot, you can continue from the Azure Portal as I did, or download the ARM template and scripts, and run them locally. Once you have created the chatbot, you will have the option to download the source code as a ZIP file from the Bot Management Build console. I prefer to use the JetBrains WebStorm IDE to develop my Node.js-based bots, and GitHub to store my source code. As part of developing the chatbot, you will need to add two additional application settings to the Azure App Service the chatbot is running within. The Cosmos DB connection string (COSMOS_DB_CONN_STR) and the URL of your blob storage container (ICON_STORAGE_URL) will both be referenced from within our bot, as an environment variable. You can manually add the key/value pairs from the Azure Portal (shown below), or programmatically. The chatbot’s code, in the app.js file, is divided into three sections: Constants and Global Variables, Intent Handlers, and Helper Functions. Let’s look at each section and its functionality. Below is the Constants used by the chatbot. 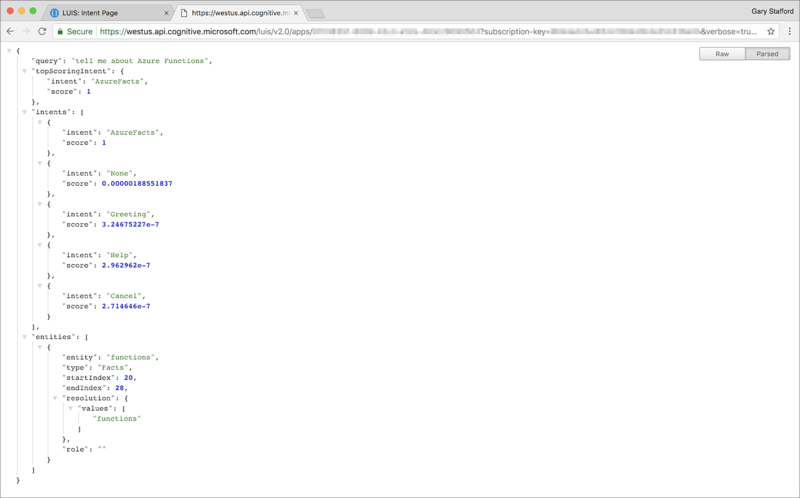 I have preserved Azure’s boilerplate template comments in the app.js file. The comments are helpful in understanding the detailed inner-workings of the chatbot code (gist). 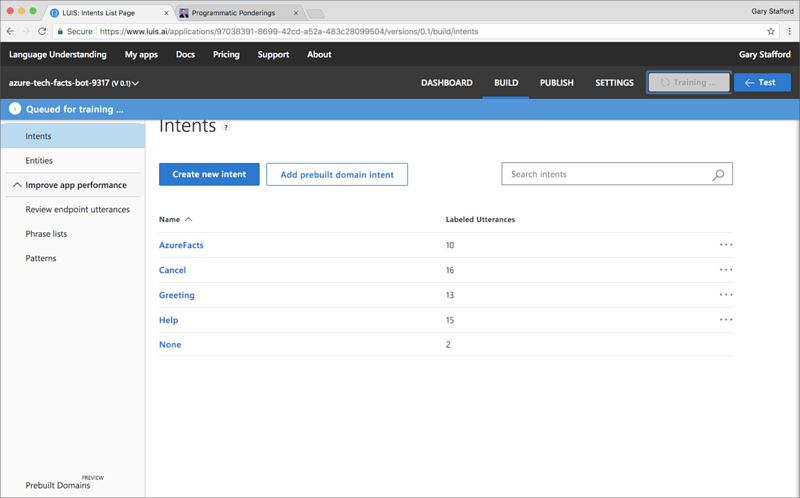 Notice that using the LUIS-enabled Language Understanding template, Azure has provisioned a LUIS.ai app and integrated it with our chatbot. More about LUIS, next. The next part of our chatbot’s code handles intents. Our chatbot’s intents include Greeting, Help, Cancel, and AzureFacts. The Greeting intent handler defines how the bot handles greeting a new user when they make an explicit invocation of the chatbot (without intent). The Help intent handler defines how the chatbot handles a request for help. The Cancel intent handler defines how the bot handles a user’s desire to quit, or if an unknown error occurs with our bot. The AzureFact intent handler, handles implicit invocations of the chatbot (with intent), by returning the requested Azure fact. We will use LUIS to train the AzureFacts intent in the next part of this post. Each intent handler can return a different type of response to the user. 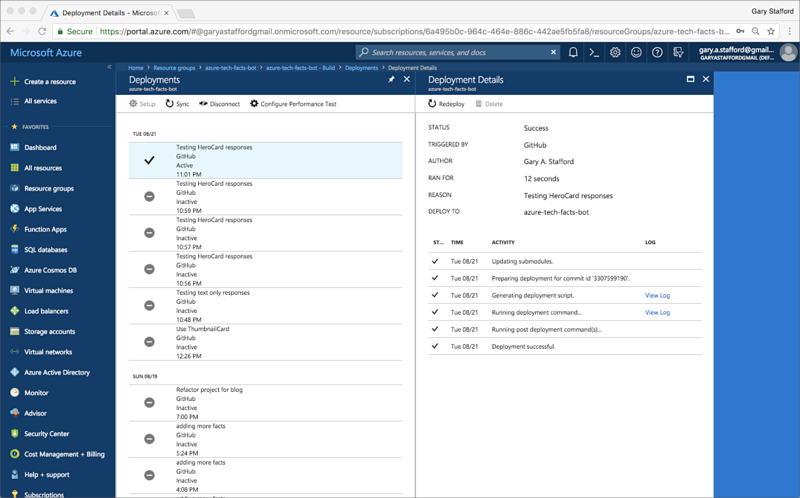 For this demo, we will have the Greeting, Help, and AzureFacts handlers return a ThumbnailCard, while the Cancel handler simply returns a text message (gist). The last part of our chatbot’s code are the helper functions the intent handlers call. The functions include a function to return a random fact if the user requests one, selectRandomFact(). There are two functions, which return a ThumbnailCard or a HeroCard, depending on the request, createHeroCard(session, botResponse) and createThumbnailCard(session, botResponse). The buildFactResponse(factToQuery, callback) function is called by the AzureFacts intent handler. This function passes the fact from the user (i.e. certifications) and a callback to the findFact(factToQuery, callback) function. The findFact function handles calling Cosmos DB, using MongoDB Node.JS Driver’s db.collection().findOne method. The function also returns a callback (gist). We will use LUIS to add a perceived degree of intelligence to our chatbot, helping it understand the domain-specific natural language model of our bot. If you have built Alexa Skills or Actions for Google Assitant, LUIS apps work almost identically. The concepts of Intents, Intent Handlers, Entities, and Utterances are universal to all three platforms. Intents are how LUIS determines what a user wants to do. LUIS will parse user utterances, understand the user’s intent, and pass that intent onto our chatbot, to be handled by the proper intent handler. The bot will then respond accordingly to that intent — with a greeting, with the requested fact, or by providing help. LUIS describes an entity as being like a variable, used to capture and pass important information. 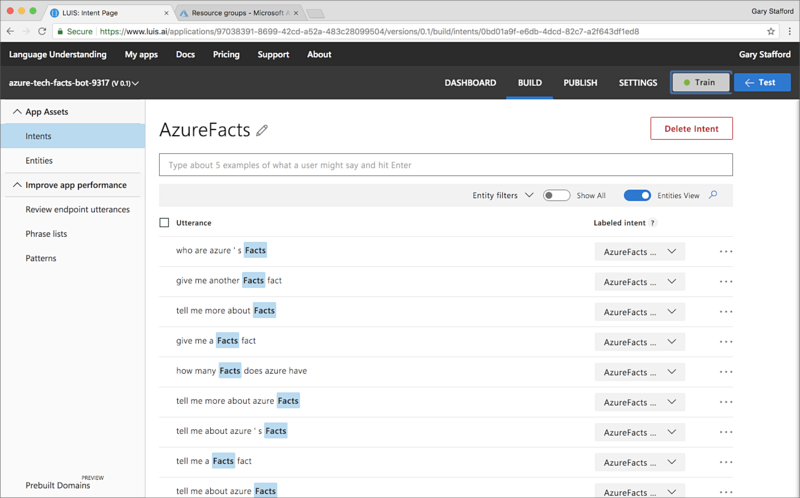 We will start by defining our AzureFacts Intent’s Facts Entities. The Facts entities represent each type of fact a user might request. The requested fact is extracted from the user’s utterances and passed to the chatbot. LUIS allows us to import entities as JSON. I have included a set of Facts entities to import, in the azure-facts-entities.json file, within the project on GitHub (gist). Each entity includes a primary canonical form, as well as possible synonyms the user may utter in their invocation. If the user utters a synonym, LUIS will understand the intent and pass the canonical form of the entity to the chatbot. For example, if we said ‘tell me about Azure AKS,’ LUIS understands the phrasing, identifies the correct intent, AzureFacts intent, substitutes the synonym, ‘AKS’, with the canonical form of the Facts entity, ‘kubernetes’, and passes the top scoring intent to be handled and the value ‘kubernetes’ to our bot. The bot would then query for the document associated with ‘kubernetes’ in Cosmos DB, and return a response. Once we have created and associated our Facts entities with our AzureFacts intent, we need to input a few possible phrases a user may utter to invoke our chatbot. Microsoft actually recommends not coding too many utterance examples, as part of their best practices. Below you see an elementary list of possible phrases associated with the AzureFacts intent. You also see the blue highlighted word, ‘Facts’ in each utterance, a reference to the Facts entities. LUIS understands that this position in the phrasing represents a Facts entity value. Patterns, according to Microsoft, are designed to improve the accuracy of LUIS, when several utterances are very similar. By providing a pattern for the utterances, LUIS can have higher confidence in the predictions. The topic of training your LUIS app is well beyond the scope of this post. Microsoft has an excellent series of articles, I strongly suggest reading. They will greatly assist in improving the accuracy of your LUIS chatbot. Once you have completed building and training your intents, entities, phrases, and other items, you must publish your LUIS app for it to be accessed from your chatbot. Publish allows LUIS to be queried from an HTTP endpoint. The LUIS interface will enable you to publish both a Staging and a Production copy of the app. For brevity, I published directly to Production. If you recall our chatbot’s application settings, earlier, the settings include a luisAppId, luisAppKey, and a luisAppIdHostName. Together these form the HTTP endpoint, LuisModelUrl, through which the chatbot will access the LUIS app. Using the LUIS API endpoint, we can test our LUIS app, independent of our chatbot. This can be very useful for troubleshooting bot issues. Below, we see an example utterance of ‘tell me about Azure Functions.’ LUIS has correctly deduced the user intent, assigning the AzureFacts intent with the highest prediction score. LUIS also identified the correct Entity, ‘functions,’ which it would typically return to the chatbot. With our chatbot developed and our LUIS app built, trained, and published, we can deploy our bot to the Azure platform. There are a few ways to deploy our chatbot, depending on your platform and language choice. I chose to use the DevOps practice of Continuous Deployment, offered in the Azure Bot Management console. With Continuous Deployment, every time we commit a change to GitHub, a webhook fires, and my chatbot is deployed to the Azure platform. If you have high confidence in your changes through testing, you could choose to commit and deploy directly. Alternately, you might choose a safer approach, using feature branch or PR requests. In which case your chatbot will be deployed upon a successful merge of the feature branch or PR request to master. 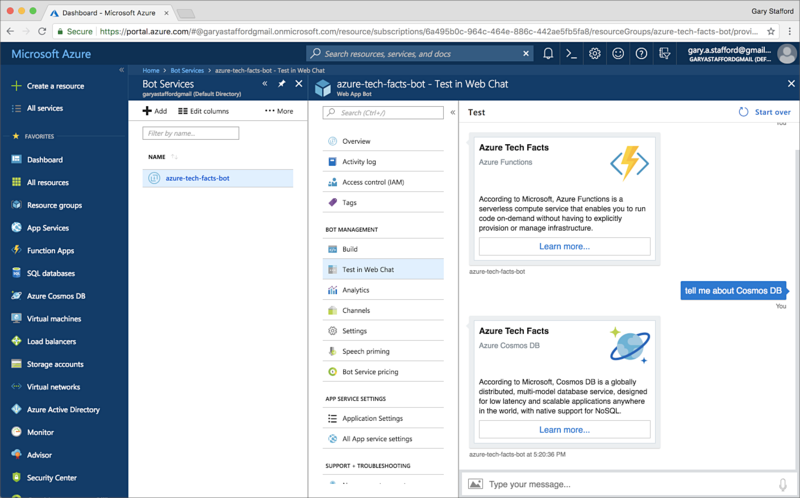 Azure provides the ability to test your bot, from the Azure portal. Using the Bot Management Test in Web Chat console, you can test your bot using the Web Chat channel. We will talk about different kinds of channel later in the post. This is an easy and quick way to manually test your chatbot. For more sophisticated, automated testing of your chatbot, there are a handful of frameworks available, including bot-tester, which integrates with mocha and chai. Stuart Harrison published an excellent article on testing with the bot-tester framework, Building a test-driven chatbot for the Microsoft Bot Framework in Node.js. As part of testing and troubleshooting our chatbot in Production, we will need to review application logs occasionally. Azure offers their Log streaming feature. 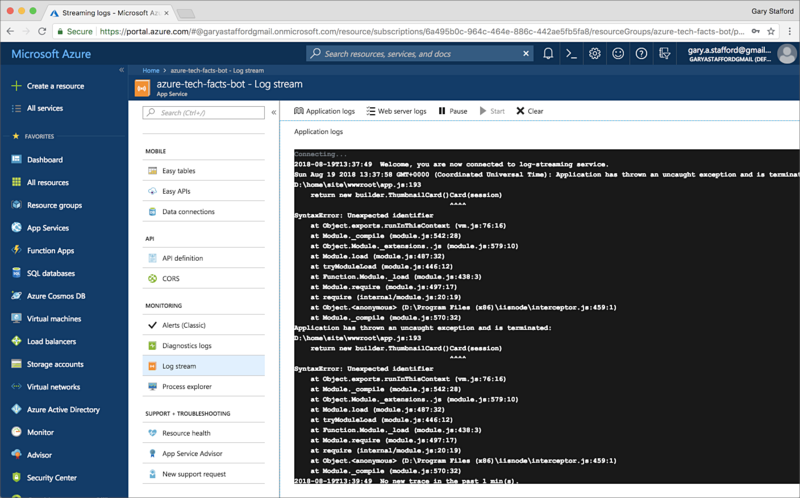 To access log streams, you must turn on application logging and chose a log level, in the Azure Monitoring Diagnostic logs console, which is off by default. Once Application logging is active, you may review logs in the Monitoring Log stream console. Log streaming will automatically be turned off in 12 hours and times our after 30 minutes of inactivity. I personally find application logging and access to logs, more difficult and far less intuitive on the Azure platform, than on AWS or Google Cloud. 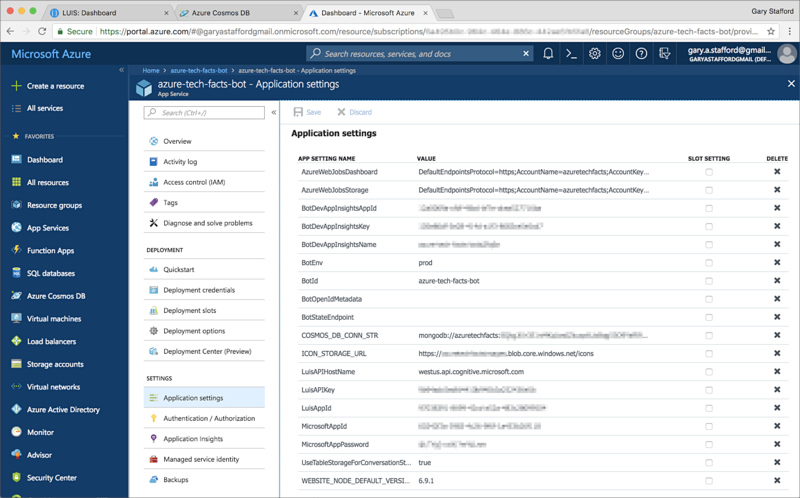 As part of testing and eventually monitoring our chatbot in Production, the Azure App Service Overview console provides basic telemetry about the App Service, on which the bot is running. With Azure Application Insights, we can drill down into finer-grain application telemetry. With our chatbot built, trained, deployed and tested, we can integrate it with multiple channels. Channels represent all how our users might interact with our chatbot, Web Chat, Slack, Skype, Facebook Messager, and so forth. Microsoft describes channels as a connection between the Bot Framework and communication apps. For this post, we will look at two channels, Web Chat and Slack. Enabling Web Chat is probably the easiest of the channels. When you create a bot with Bot Service, the Web Chat channel is automatically configured for you. You used it to test your bot, earlier in the post. Displaying your chatbot through the Web Chat channel, embedded in your website, requires a secret, for which, you have two options. Option one is to keep your secret hidden, exchange your secret for a token, and generate the secret. Option two, according to Microsoft, is to embed the web chat control in your website using the secret. This method will allow other developers to easily embed your bot into their websites. Embedding Web Chat in your website allows your website users to interact directly with your chatbot. Shown below, I have embedded our chatbot’s Web Chat channel in my website. It will enable a user to interact with the bot, independent of the website’s primary content. 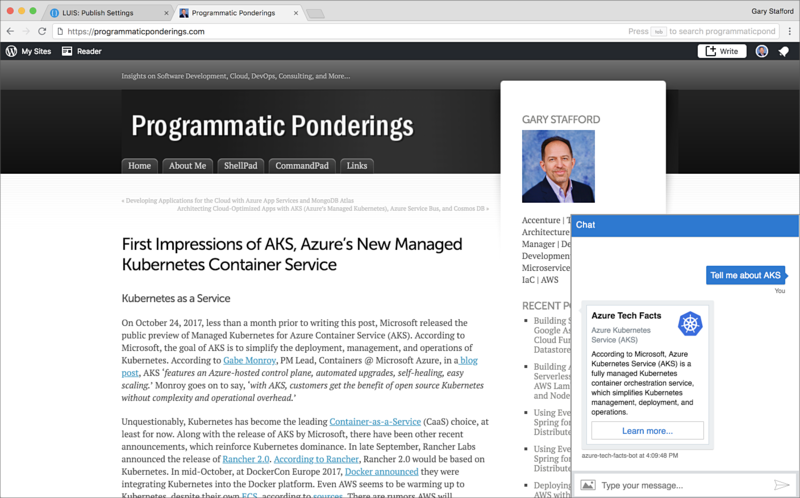 Here, a user could ask for more information on a particular topic they found of interest in the article, such as Azure Kubernetes Service (AKS). The Web Chat window is collapsible when not in use. To integrate your chatbot with the Slack channel, I will assume you have an existing Slack Workspace with sufficient admin rights to create and deploy Slack Apps to that Workspace. To integrate our chatbot with Slack, we need to create a new Bot App for Slack. The Slack App will be configured to interact with our deployed bot on Azure securely. Microsoft has an excellent set of easy-to-follow documentation on connecting a bot to Slack. I am only going to summarize the steps here. Once your Slack App is created, the Slack App contains a set of credentials. 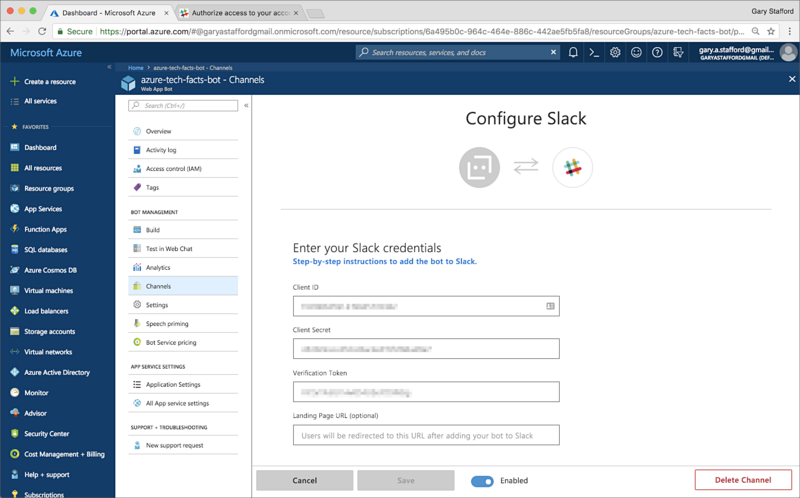 Those Slack App credentials are then shared with the chatbot, in the Azure Slack Channel integration console. This ensures secure communication between your chatbot and your Slack App. Part of creating your Slack App, is configuring Event Subscriptions. 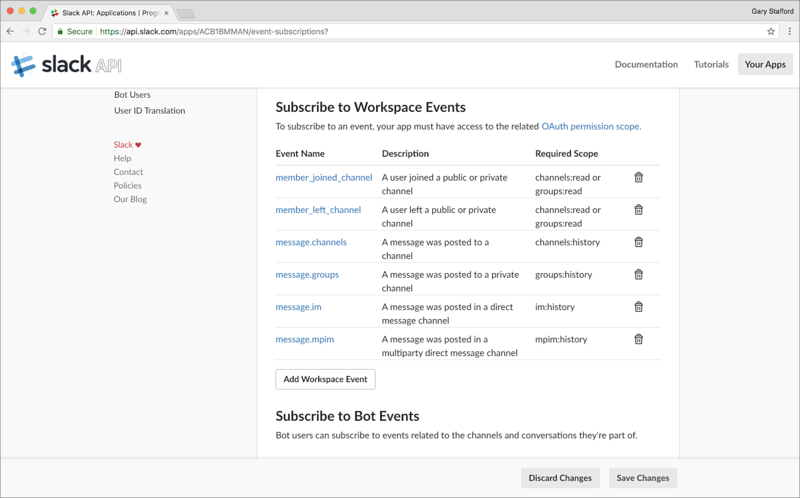 The Microsoft documentation outlines six bot events that need to be configured. By subscribing to bot events, your app will be notified of user activities at the URL you specify. You also configure a Bot User. Adding a Bot User allows you to assign a username for your bot and choose whether it is always shown as online. This is the username you will see within your Slack app. 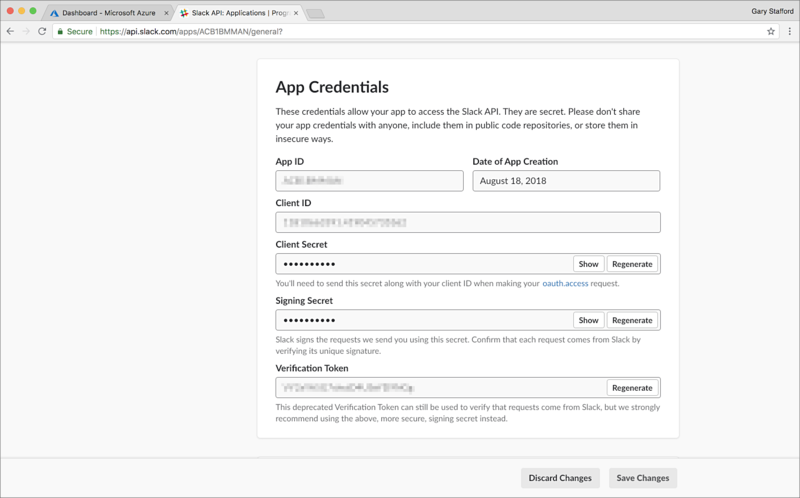 Once the Slack App is built, credentials are exchanged, events are configured, and the Bot User is created, you finish by authorizing your Slack App to interact with users within your Slack Workspace. 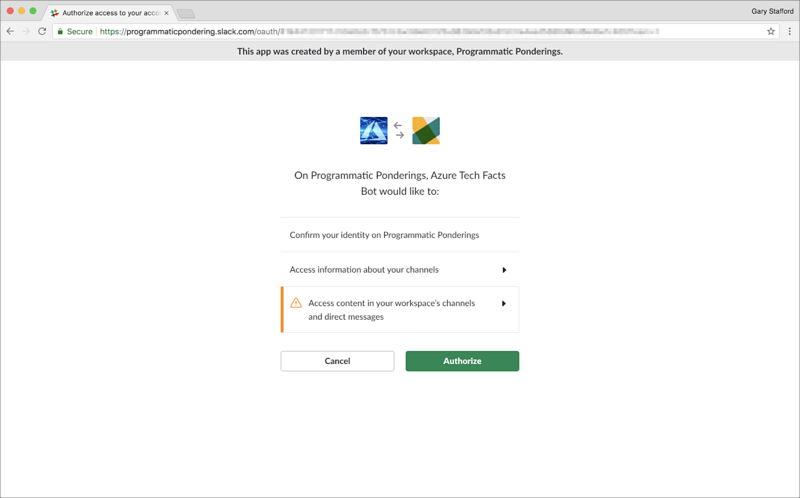 Below I am authorizing the Azure Tech Facts Bot Slack App to interact with users in my Programmatic Ponderings Slack Workspace. Below we see the Azure Tech Facts Bot Slack App deployed to my Programmatic Ponderings Slack Workspace. The Slack App is shown in the Slack for Mac desktop app. 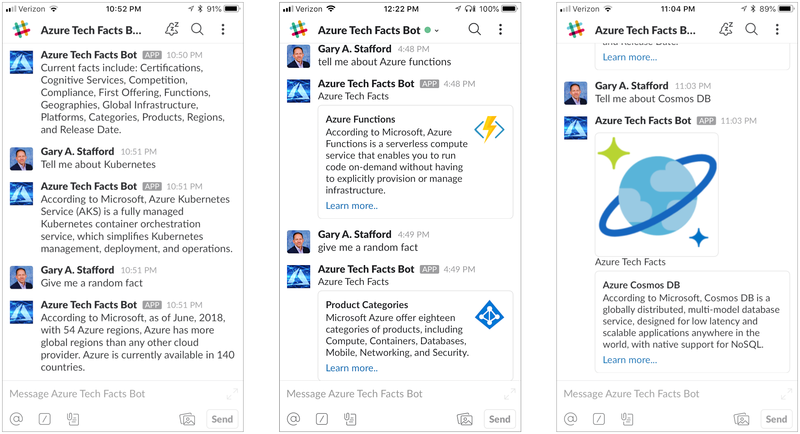 Similarly, we see the same Azure Tech Facts Bot Slack App being used in the Slack iOS App. 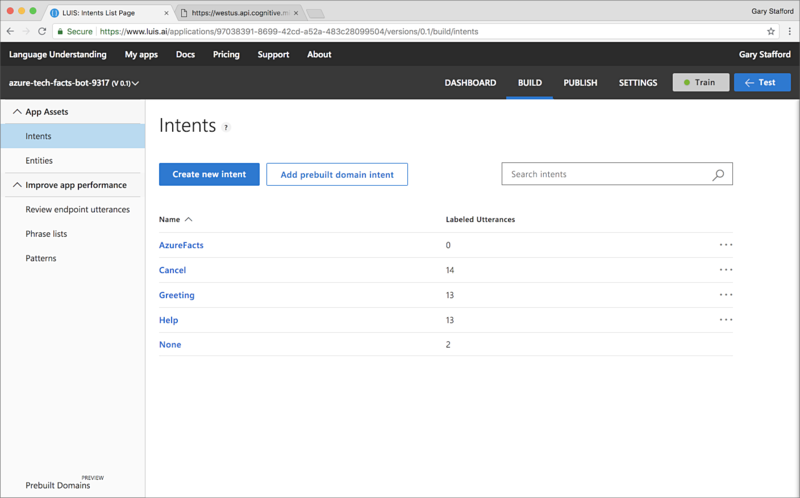 In this brief post, we saw how to develop a Machine learning-based LUIS-enabled chatbot using the Azure Bot Service and the BotBuilder SDK. We enhanced the bot’s functionality with two of Azure’s Cloud services, Cosmos DB and Blob Storage. Once built, we integrated our chatbot with the Web Chat and Slack channels. This was a very simple demonstration of a LUIS chatbot. 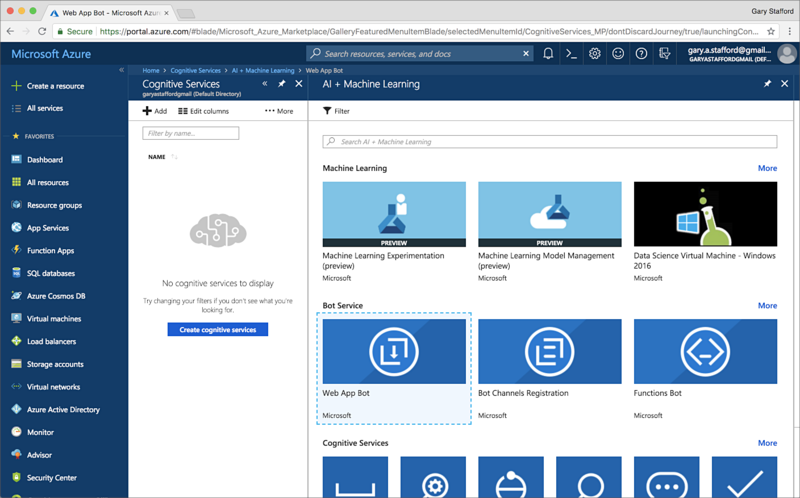 The true power of intelligent bots comes from further integrating bots with Azure AI and Machine Learning Services, such as Azure’s Cognitive Services. Additionally, Azure cloud platform offers other more traditional cloud services, in addition to Cosmos DB and Blob Storage, to extend the feature and functionally of bots, such as messaging, IoT, Azure serverless Functions, and AKS-based microservices. All opinions expressed in this post are my own and not necessarily the views of my current or past employers, their clients, or Microsoft.